The late Marvin Lipofsky was there at the birth of the American studio glass movement, shaping its course as he shaped his own sculptures. GA Series 1994–99 #5, 10 x 21 1⁄2 x 13 inches, Novy Bor, Czech Republic, 1999, Marvin Lipofsky with help from Stefen Stefko and team. Line up piece after piece by the late glass sculptor Marvin Lipofsky and something wonderful happens. No matter where it was made, or how, or when, or with whom, there is no mistaking its author. 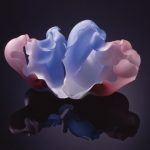 Be it a semi-striated, candy-hued form from his “Fratelli-Toso” series, created in the late 1970s in Murano, Italy; or Otaru Series 1987 #4, a delicately colored, flower-like shape that sprang to life in Hokkaido, Japan; or Australian Landscape 2004 #4, which seems ready to float off the table and head for the Great Barrier Reef once your back is turned; they are all unmistakably Lipofskys. Though he signed his work, he didn’t need to ; even an utterly unschooled person pulled off the street could glance at a grouping of his sculptures and see right away that they are all from the vision of a single artist. It’s a test that only the greatest can pass. Lipofsky was born near Chicago in 1938 and was far more influenced by National Geographic than by any art magazine. He fell under the spell of travel long before he fell under the spell of glass sculpting, getting away when he could, because he could, so he could learn something new that was best learned by leaving home. Once hired by the University of California, Berkeley in 1964 to found and direct its glass program, he used his academic credentials as a skeleton key to open the doors of glass factories around the world. He ultimately traveled to more than 30 countries to toil alongside local artisans and students in their hot shops. 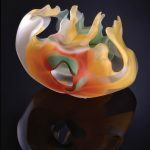 But Lipofsky went with it, and thus became one of the handful of graduate students who midwifed the birth of the American studio glass movement, finding their way with the help of a furnace set up in a garage at Littleton’s 80-acre farm in nearby Verona, Wis. 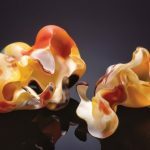 Through these humble origins, glass began to move from the realm of the functional to fine art, and glass artisans felt the freedom they needed to evolve into glass artists. Lipofsky would become the most famous of Littleton’s earliest recruits (future superstar Dale Chihuly would come through later) in part by accepting a job offer that Littleton passed to him as he approached graduation—the post at Berkeley. It ended in 1972, but Lipofsky also continued to teach at the California College of Arts and Crafts (since renamed as the California College of the Arts) for 15 more years, and in addition he led at least 300 workshops in the course of his long career, doggedly and generously sharing the information that he harvested on his travels with all who were eager to receive it. Lipofsky evolved a way of working that was simple but by no means easy. 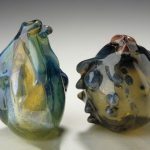 It started with visiting a glassworks far from his Berkeley studio. Within a span of time that was as short as it was intense (typically from one to three days), he would create new works in concert with the away team, directing as they blew glass into the hand-carved wooden molds that he brought with him. This ability to fall in with strangers, many of whom did not speak English, and achieve what he wanted with them might be the most underappreciated aspect of Lipofsky’s genius, and again, it has its roots in his ability to go with the flow. He learned to size up a team of glass artisans quickly and correctly, and he worked within their capabilities rather than trying to impose on them to any great extent. Working within a team’s capabilities also meant working with whatever materials their hot shop had on hand. If it was rich in chemicals that yielded red-colored glass, as he found in China, then he favored red in his sculptures. In Murano, he did as the Muranese did. Lipofsky might learn a few key words in the native tongue ahead of time, and he would rely on a translator when necessary, but everyone involved had at least one language in common: that of glass-making. 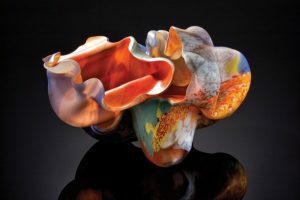 Lipofsky’s interpretation of going with the flow often extended as far as reflecting the time of year at which he visited a glass factory. The oranges, yellows, and browns in pieces made in Ukraine capture the late-fall hues of the trees; the colors of the cherry blossom-laden spring and the magnificently blue ocean waters that he saw in Japan found their way into the glass. 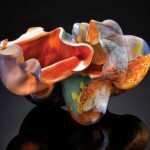 After the excitement, the intensity, and the camaraderie of fashioning new pieces in a faraway hot shop, Lipofsky would have them shipped back to his Berkeley studio, where he would cold-work them into finished art. The two phases of his artistic process were as different as they could possibly be; speed and teamwork gave way to contemplation and solitude. Though Lipofsky trekked the globe as often as he could, even taking off during the school year if the invitation was tempting enough, he returned to the same physical studio space for much of his artistic life. Once home, he didn’t drop his luggage and pry the shipping crates open straight away. On the contrary, he preferred to let the last trip’s yield sit for a while before starting to aim his brain at it. Over the course of days and sometimes weeks, Lipofsky would sandblast and shape the glass, cutting away material as he wished so he could reveal and enhance the mysteries of the interior. He did this alone, always alone. He has roughly 1,500 glass sculptures to his name, not including countless others created during symposia, demonstrations, and other events. As you might be expected of someone who goes with the flow, Lipofsky showed no interest in spending his time articulating and describing the forces that animated his sculptures. He dismissed artist’s statements as so much useless faffery, and while he recognized what other people might see in his works, be it a literal resemblance to a shell or a bodily organ, or an impression of sensuality of the sort that radiates from a Georgia O’Keeffe canvas, he wasn’t willing to go so far as to validate their reactions. In a lengthy 2003 interview for a Smithsonian oral history project, he commented, “I’ve always said that there wasn’t any real symbolic symbols to most of my work. That’s just what the glass did. And the glass did those things without having to try very hard with it.” In other words, Lipofsky devoted himself to following the glass where it led him. Lipofsky died this past January at the age of 77. Though he had begun to slow down his pace in 2008—standing and holding a 25-piece of glass for hours upon hours of cold-working is a taxing feat at any age—his death came as a shock. Lipofsky himself hadn’t accepted the fact of his own eventual demise to the point of drafting comprehensive instructions on what, exactly, to do with his estate. Particularly challenging is the question of how to deal with the 50-odd works that were left sitting in his studio, waiting for the artist’s attention. Lipofsky’s death also closed the door on a tantalizing might-have-been voiced by Corning Museum of Glass curator Tina Oldknow in her foreword to the book Marvin Lipofsky: A Glass Odyssey. In noting how he had personally assembled a priceless visual record of American studio glass history through taking tens of thousands of photographs during his rich and remarkable career, she said, “I would love to see this material gathered into a book with Lipofsky’s own, inimitable commentary.” Sadly, that 2003 book on the artist is the publication that comes the closest to filling the gap that she identifies. 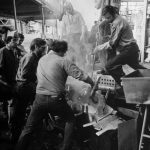 Since Oldknow retired in 2015, it falls to others to assemble Lipofsky’s five decades of documentary material into a magnificent whole that would detail the spark and the spread of the American studio glass movement from his unique vantage point.